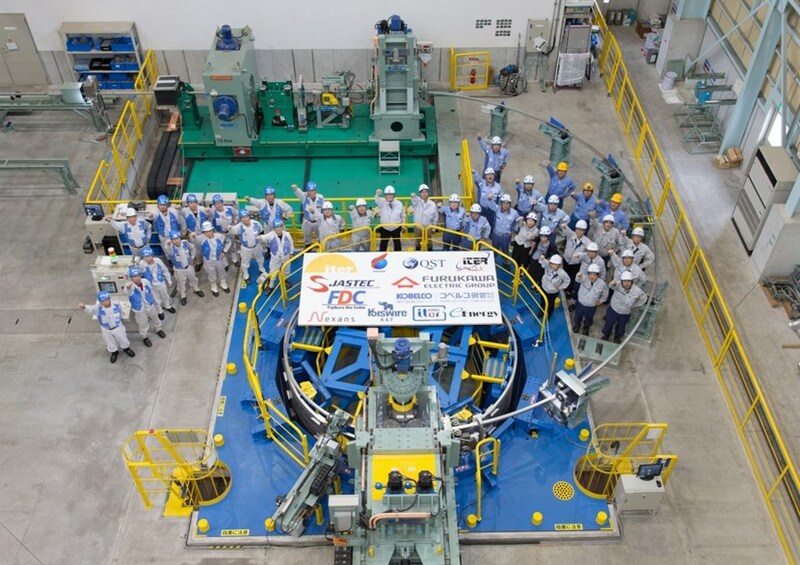 The Japanese Domestic Agency has successfully completed the procurement of 43 kilometres (700 tonnes) of niobium-tin cable-in-conduit superconductor for ITER's central solenoid magnet. The last crate of spooled conductor has now left Japan for the coil manufacturer in the United States. In an eight-year campaign to design, test and produce the central solenoid conductor, Japanese industry manufactured 43 kilometres (some 700 tonnes) of material. The central solenoid is tower-shaped magnet in the centre of the machine that will induce a powerful current in the ITER plasma and maintain it during long plasma pulses. Thirteen metres tall (18 metres, with structure), four metres wide and one thousand tonnes, the central solenoid is made of six independent coil packs wound from niobium-tin superconductor. The Japanese Domestic Agency for ITER is responsible for supplying 100 percent of the central solenoid conductors. Eight years after the Procurement Arrangement was signed with the ITER Organization, the full scope has been achieved. Forty-nine unit lengths of superconductor have now been shipped to the United States, where coil manufacturing is underway at General Atomics (San Diego, California) under the procurement responsibility of the US Domestic Agency. The ITER central solenoid will top the charts as the largest solenoid ever built for a fusion device. Maximum field of 13 tesla will be reached in the centre of the central solenoid for a current of 40 kA (up to a maximum of 46 kA in some modules). Superconductors such as these—successfully developed to reach such demanding technical specifications—can also be expected to have applications in the fields of superconducting power transmission, systems for electricity storage, and the miniaturization of medical accelerators. Read the press release in Japanese on the QST website (National Institutes for Quantum and Radiological Science and Technology).